After a few nights of Nyquil, I seem to be back on the right track. I am starting to think my flu like feeling was less about having the flu or a cold and more my body’s response to the high levels of stress I have been dealing with. I find that sometimes it takes getting sick for me to prioritize and take care of myself, in theory I love the idea of daily self care but at times it’s harder to fit it into the schedule. This morning found me thinking about money, it has been a while since I have talked money here. I have a confession; I think I am a spend-a-holic. On paper I write the most magnificent budgets, they come across as practical yet in practice I struggle. It seems every trip to the grocery store inevitably costs more than I budget and well an extra $50 here and $50 there starts to add up. I will say though that this month I have accomplished one goal and that is very little eating out. When I feel the urge to eat out I ask myself do I really need this. Will that meal make me feel great or is the bigger issue that I just don’t want to cook? If what I really want is to simply avoid cooking, I have been using up my stash of soups and chowders I keep in my freezer. Tasty, good for my waist line and even better for my budget. The results so far are that I have been able to add a little extra to the savings account and I realized that I have not raided my savings account in several months. Baby steps, that’s what it’s all about for me. A few days ago one of my employees called me up and decided to forget the boundaries that should exist between employer and employee and long story short, she is grappling with serious financial issues. I had no real words of advice other than if need be I would be happy to assist her with a budget. Another employee just bought a brand new car that truthfully I wonder how she will afford knowing that she is already tight on cash. Yes a car in Maine is mostly a necessity but a brand new car is not a necessity. Hell, as the Spousal Unit and I are learning even relatively new cars require maintenance hence last month’s unexpected $1200+ in car repairs not covered by the limited warranty we still have on our car. I work with people who deal with financial scarcity day in and day out; almost 20 years ago I dealt with that same scarcity. The type where you are hoping and praying you can keep the lights on until your next check. While I still have a ways to go financially as far as digging out of debt, I have learned to take care of my 4 walls and keep a little cushion so that an unexpected $100 bill is not a crisis. So many times with the clients that I work with it is truly the little things that take an already precarious financial situation and turn it into a full blown crisis. One of my tricks to building a cushion has been rounding off numbers. We have a number of automatic withdrawals such as Vonage, Netflix, etc. Over the past 7 years I started rounding upwards, a $25.52 bills become $30 and so on, by doing this I create a cushion so eventually you create a decent cushion. I am not by nature a saver and grew up with parents who didn’t teach me about money so I am learning as I go along. I have also realized that not all bargain style shopping is a great deal. Thrift stores are a great source of savings yet if you go all the time and buy items you really don’t need simply because they are cheap, well you are wasting money. I have taken recreational shopping/looking out of my schedule. It seems to be working. I admit I still struggle with my daily visit to Starbucks or other coffee shops though I try not to frequent these places on the weekend when I have the time to make my own drinks at home. This past weekend found me dreaming of places I would like to visit, it has been a long time since we have been able to travel anywhere as a family. In part because travel especially from Maine is costly (I swear travel was cheaper in Chicago) the other factor in our not traveling is tied directly to finances, at one point there was no money to travel but also bad spending habits have created a situation where travel is difficult. Yet raising my child in Maine, I see that it is necessary that we travel so that my daughter is exposed to many different types of people and cultures. Much like we find the money to do necessary maintenance on our house, I now feel we must find the money to travel at the very least to see friends and family. I think having goals with my money makes it easier for me to make the sacrifices necessary to be a good steward of what I do have. Anyway excuse the ramble but with the year soon drawing to a close I am thinking about the changes I need to make when it comes to me and my money. What about you? Do you struggle with money management? If so what are you doing about it? Last night CNN aired a program Black in America 3-Debt and while I only caught about 40 minutes of the show it was um…interesting to say the least. I think as Black people we get so caught on short term financial goals (new pair of Louboutin’s, etc) that at times we miss the long term boat. I mean if your house is about to get foreclosed on, maybe it’s a good time to downsize your entire lifestyle. Anyhoo, that’s a whole other blog post. 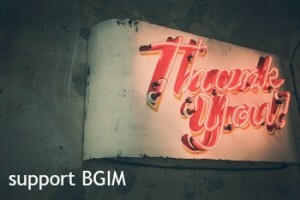 PS: While I am saving, I am still a fair distance away from being able to buy a much needed new computer, consider contributing to the BGIM computer beg-a-thon. It is still happening. At this point if I can raise even half the cost of the computer, I may be able to handle the rest myself. Just a reminder, as always no pressure. Sounds like we had same type of upbringing in terms of financial education. I don’t know if it’s a working class mentality or what … or maybe it’s just how most people function by default. Maybe it doesn’t really come natural to “save” for a rainy day – after all, for most of our lives as humans on this planet, we shared resources as communities, not as individuals or tiny nuclear family units. But that’s another topic. Yes, we are very much in same boat, and eating out is our big thing. Hubby doesn’t have many indulgences – he doesn’t care about his clothes, or drinking, or going out, or any of that stuff, but he does like to eat out. It’s his luxury. So restricting our eating out has saved us a lot of money but it’s also a struggle. I’m always out and about with our kidlet, so it’s easy to pick up a $3 Odwalla smoothie or a $3 slice of banana bread or a $9 salad at a sit down restaurant, etc. Next thing I know, I’ve spent $20 in a single day on eating out. I’m glad you recognize travel as essential. I agree that it’s very important for kids to see what else is out there and not just assume that life is the same everywhere based on where they grew up. I have always been pretty good with savings and money management, but major surgery 4 years ago and opening my own busines in 2009 have taken a toll on my savings. I think most people don’t realize that good money management is just as much an emotional process as it is a learned skill. As not to repeat what BGIM stated (which I agree with 150%), I know from personal and professional experience that our ability to manage money well is directly related to our self-esteem, our current emotional and mental health states and our personal perspectives on the value of money. I’ve seen people who were excellent at managing their money fall into debt, stop paying their bills (hell, stop opening their mail) as a result of clinical depression. I’ve seen people spend waaaaaaay too much money on clothing, makeup and other gadgets to compensate for the fact that they don’t like themselves to the core. And I’ve seen people spend 4-5 figure income tax return checks in a few days because they don’t care enough about themselves to see a future where that money could be of greater value. As a therapist I’ve learned a lot more about money and it’s relationship to our emotions through the trials and tribulations of my clients. Anecdotally speaking, the moment that people are able to enhance and nurture their emotional and mental health, I see significant gains in the financial health and financial literacy, whether they grew up with a good financial education/upbringing at home or not.